As with anything, there are a few obstacles. I know I have to get past all the worries and inconveniences running through my mind: this will take forever, it will be easier if I do it myself, what about the mess? Yes, it will take longer to get dinner on the table or lunches in the lunch boxes. And yes, there will be a bigger mess than if you cooked it yourself. By assuming the process will take longer, I avoid feeling rushed which takes the fun out of it for all of us. And the clean up will take longer, but your child can lead the clean up crew if he or she is old enough. What a great opportunity for your child to be in charge! And if your child is younger, he or she can help dry the dishes or put them away. We’ve missed a few weeks cooking together because of schedules and just life in general. But we managed this week. Ellie wanted to make breakfast for dinner. She decided on the menu: homemade waffles, bacon and fruit. We had a great time cooking together! I cooked the bacon and she took care of the waffles and fruit (raspberries and some pre-cut pineapple we had on hand). I was glad she chose waffles, because she could make them completely on her own with only a reminder that the waffle iron was hot. Waffles are easy to make with kids. There are lots of steps even younger kids can do on their own: cracking eggs, measuring, stirring, filling the waffle iron with the batter. We used Alton Brown’s waffle recipe https://altonbrown.com/waffle-recipe/ (I’m a big fan of him and of his recipes!) I encouraged Ellie to read the recipe through first and then gather the ingredients. It also helps to know if you need to do anything, like preheat the oven or have items at room temperature. 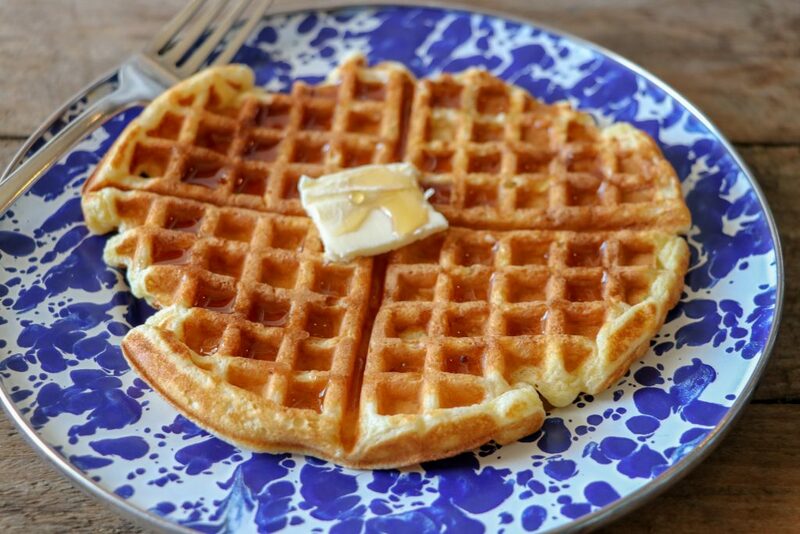 In the case of the waffle recipe, the buttermilk needed to be room temperature which takes some time. (That said, if you don’t get the buttermilk out with enough time to come to room temperature, you can put it in the microwave on high for 30 seconds-1 minute depending on your microwave). We didn’t have any whole wheat pastry flour the recipe called for, so we substituted white, all-purpose flour. Pastry flour has a lower protein content than all purpose flour, so it develops less gluten. Since more gluten is developed with all purpose flour, the texture of the waffles was a bit different than if we had used pastry flour. We all thought the waffles turned out great. They were just crispy and chewy enough that when I topped mine with butter and syrup, they became just the right level of soggy. 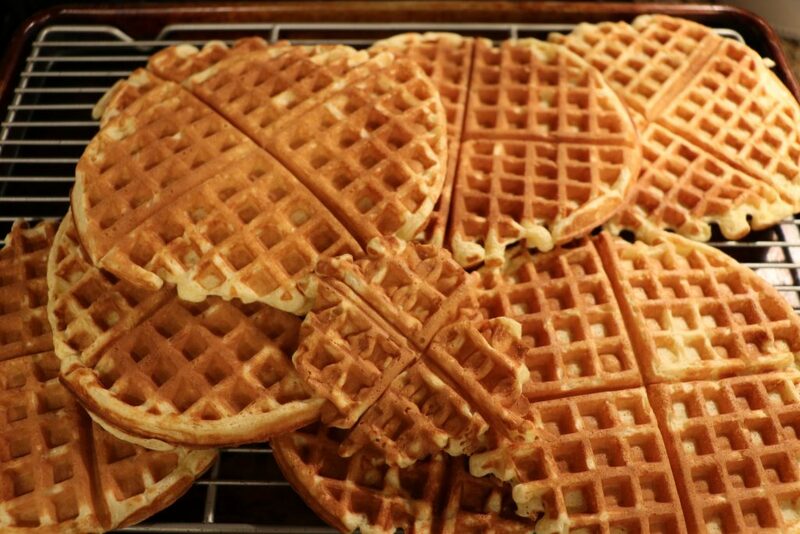 The recipe makes a lot of waffles, but you can cool the leftovers (on a cooling rack) and freeze them in a ziplock bag. Pop them in the toaster for a quick breakfast or snack. Or use them in place of bread to make a peanut butter and maple syrup sandwiches. Or maybe even save them for dinner next week. While we were cooking, Ellie asked me where waffles originated. (Cooking also fosters curiosity)! We did some looking on the internet and wow, there’s a lot of information about waffles out there! Ellie was super proud of the dinner we cooked together. She began the clean up process and set the table without being asked. What do you enjoy cooking with your children?